The processing of affective information has many attributes that make it special, such as speed, and relative independence from attention and awareness. A key question, therefore, both from basic and applied perspectives is how this happens. An extraordinarily popular account is that a so-called low road from the retina via the superior colliculus and pulvinar conveys information to the amygdala. The general idea is that, because the pathway is entirely subcortical, processing would then be automatic. This proposal has captured the attention of the research community and has fostered several lines of investigation — what is the role of attention, of awareness, how fast are certain effects, what type of visual information is conveyed (low vs. high spatial frequency), etc. Although these questions are interesting, the subcortical pathway idea is, in my view, largely based on an idea, rather than solidly grounded on empirical data. So for a while now, Ralph Adolphs and I have been discussing what are serious problems with the notion of automatic subcortical processing of affective information. 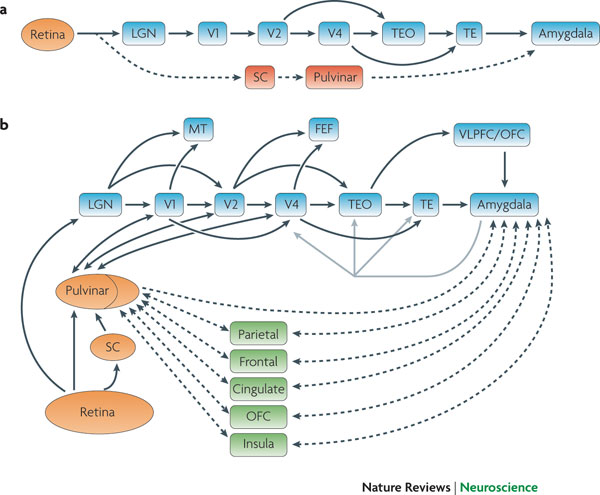 We have now written up some of these ideas in this Opinion piece in Nature Reviews Neuroscience. We also propose a new scheme, called the multiple-waves model that is intended to be an alternative to the “standard view”. It looks like part (B) of this figure, in contrast to the more traditional view shown in (A). 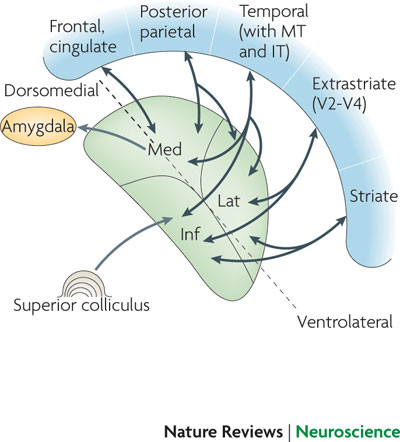 The proposal also incorporates the fact that the pulvinar is a highly integrative thalamic region, with extensive interconnectivity with much of cortex, as shown below. The pulvinar works in a way that integrates cortical-subcortical processing.